HONG KONG - Those that know me personally know that my favorite Chinese leader is Liu Shao-qi. I've read many books on China's modern history, from the 1949 revolution through the dark days of Mao's Cultural Revolution. Ironically, the book I'm not particularly fond of (Mao: The Unknown Story, by Jung Chang) is the one that really made Liu stand out. 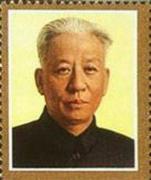 President Liu Shao-qi struck me as one of the bravest of the Chinese leaders. I've understood why Chinese people seem to adore Zhou Enlai: he was a survivor who Chinese people believe genuinely cared for them. He did what he could to remain in power and influence Mao's decisions as much as possible (although exactly how much influence he really had is debatable). Liu, however, died for his cause. He wasn't afraid to speak up to Mao during the Great Leap Forward, when he saw the destruction that was being wrought in the countryside. Liu became disenchanted with communist rule because he saw that the revolution wasn't resulting in the promised utopia for the working class. He wanted changes, he wanted help for peasants, and he knew Mao was the cause of great suffering. After challenging Mao's ideas, Liu was one of the first to be purged at the beginning of the Cultural Revolution. He died a lonely death in a jail cell after succumbing to repeated beatings. His wife, Wang Guangmei, died in 2006. Chinese officials led by President Hu Jintao on Tuesday marked the 110th anniversary of the birth of Liu Shaoqi, late President and Communist leader who was prosecuted and died during the Cultural Revolution. "We are gathered here with deep respect to remember his contribution to the independence and liberation of China, the development of the country and welfare of the people," said Hu at the ceremony. State leaders Jia Qinglin, Li Changchun, Xi Jinping, Li Keqiang,He Guoqiang and Zhou Yongkang attended the ceremony presided over by Premier Wen Jiabao. Liu worked hard for the cause of Party and people all his life, making great contribution to the revolution and construction of socialism in China, Hu said. First of all, if they were celebrating his birthday, Hu and the boys were a little early: Most sources say Liu was actually born on November 24, 1898. I also suspect that Xinhua meant “persecuted” because there really wasn’t much of a trial. Liu was arrested in 1968 following his fall from grace during the early stages of the Cultural Revolution, and was left to linger in prison for two years as a ‘living target’ in propaganda campaigns and political speeches before finally succumbing to illness, neglect, and mistreatment on–and I don’t know how you like your irony served, I like mine on toast–November 12, 1969. Yep, the CCP chose to honor the birthday of a man they purged and tortured on the anniversary of the day he finally succumbed to his imprisonment. Whatever the case, it's nice to see a true revolutionary being honoured by the current leadership.